Let us now praise famous Cynthia Rothrock – America’s greatest female motion-pictures martial artist of the 20th century – “The Queen of Kung-Fu”! Years ago, I wrote the screenplay for Cynthia’s “Honor & Glory”. Movie-making is like Chinese Water Torture on a rollercoaster. You get to know what everybody is really like. Always prepared and calm in the hurricane’s eye, there stood the cute blonde who is the first woman in U.S. motion-picture history who could beat up a man on the silver screen and make everybody in the audience believe she could do it in real life. Today we idolize big brother Bruce and feel like Chuck is our dad. Cynthia is mom. Make no mistake: what I say is not hype or gush. Every time in a movie or TV show when you see yet another slim actress suddenly turn into a kickboxing cyclone, you might remind yourself of who cut the template, originally. Ask any U.S. film historian. Before Cynthia Rothrock, if a woman in a movie fought a man, it was either sissy slap-fighting (which the straight-faced man absorbed unfazed, like Lee Marvin and Angie Dickinson in John Boorman’s under-rated “Point Blank”) or a lucky bop on the head with a blunt instrument (such as, say, Marylyn Maxwell delivered in any Bob Hope movie). In either case, movie conventions of the era demanded that the actress then immediately collapse into tears. Meanwhile, in real life, athletic, talented Cynthia was pioneering American women training in kung-fu. And just as there were no female fighters in motion pictures, during those early, gi-chauvenistic years of American martial arts, “pajamas”-wearing Chinese stylists were persona non grata. That’s Latin for “dissed to your face”. Once upon a time in Hong Kong, audiences liked seeing foreigners in their action films, in part because it was such a hoot to see non-Asians doing kung-fu. Naturally enough, a gutsy tournament champion like Cynthia received her invitation to take a shot at Cantonese movie-making. It so happened that while I wrote her screenplay, the Hollywood powers-that-be were arranging for Cynthia to finally bask in her long-overdue moment in the sun. Entertainment Weekly called our movie “fun” and gave us a “B”. HBO aired “Honor & Glory” as part of a career retrospective which included an in-depth interview with Cynthia and screenings of some of her best vehicles. Have you seen any of those early films, recently? The Hong Kong footage continues to impress by its energy, resourcefulness of techniques and sheer physical audacity. And these actors were actually hitting each other. Remember, this was the no-wirework 1980s heyday of the real-not-pretend gaffing of Jackie Chan and his Stunt Team. At sometime or other during each production, Cynthia ended up in the hospital. Cynthia stole her first show, “Yes, Madam”, from the ostensible star, who later changed her name and ended up playing opposite James Bond. Audiences marveled at the bone-crunching choreography of Cynthia’s battle royale (in pants and suspenders) with superstar Samo Hung in “Millionaires’ Express”. “Magic Crystal”, an Asian “E.T.” set in Greece, made money. As her career advanced, Cynthia and frequent co-star Richard Norton became the Fred Astaire and Ginger Rogers of international action movies. And among her fondest-remembered domestic vehicles are the two “China O’Brian” flicks. Hong Kong and European audiences always have appreciated the Queen more than we do at home. Our loss. 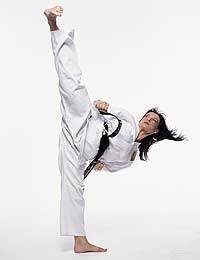 But once I saw unleashed unforgettable proof of the raw power of Cynthia Rothrock’s global fame. The great Anthony Goh let me handle publicity and be “celebrity wrangler” in ’96 for the now-legendary million-dollar Baltimore World Wushu Championships – a clobberingly huge, Olympics-size event. At the Opening Ceremonies, martial athletes from 41 nations came marching into the Baltimore Convention Center under their countries’ flags. When the master of ceremonies launched into a career-encapsulating, rhythmically-building intro of our movie-star Guest of Honor, the energy of the international crowd changed as fast as you can snap your fingers. During the long, slow build-up, people started stirring and standing, an excited hum and hubbub broke out everywhere at once, cameras flashed. By the time the master of ceremonies reached the crescendo – “Ladies and gentlemen, here tonight in person, please join with us in welcoming our Guest of Honor, China O’Brian herself, ladies and gentlemen – CYNTHIA ROTHROCK!“ and Cynthia strolled out, waving and smiling... thousands of people went berserk. Maybe you think “berserk” too strong a word? I tell you, as the Brits would say, Baltimore Civic Center went positively mental. Minutes later, when no pleas for calm could even be heard anymore, the master of ceremonies looked at me and shrugged, and finally, we literally had to call for police backup. You know what? It turned out lots of the officers were big Rothrock fans, too. We want to thank Cynthia Rothrock for her contribution of photos to this article. Washington, D.C. native Herb Borkland has been called "a martial arts pioneer" because he was an original student at the first taekwondo school in the United States. After taking his degree at The University of Virginia, Herb went on to become a closed-door student of the legendary Robert W. Smith, author of the first English-language book about tai chi. An Inside Kung-Fu Hall of Fame writer, he was the first journalist ever invited to train in SCARS, the Navy SEALs fighting system. Herb scripted "Honor&Glory" for Cynthia Rothrock, featured on HBO, as well as winning the first-place Gold Award at the Houston International Film Festival for his Medal of Honor soldier screenplay "God of War." For three years he hosted the national half-hour Black Belts cable-TV show. Herb and his wife, the Cuban-American painter Elena Maza, live in Columbia, Maryland.